2 MORE TOWED FROM STOCKLEY LIFEGUARD SPACE IN 2 DAYS! A parking space reserved for lifeguards on Stockley Street held the record last summer for the most tows of "unauthorized" vehicles. Some visitors and residents had questioned the location of the sign and markings used to reserve the pair of spaces on Stockley Street, claiming they were unclear. But during the past three years, the city made no attempt to clarify the situation, which resulted in at least eight tows last season. At the request of the beach patrol, police towed two unauthorized vehicles this past Thursday and Friday from the same parking space, even though a police officer expressed concern to her supervisor that the space was not properly marked. The sign reserving the space had changed since last season, adding to even more confusion. The former sign used downward pointing arrows to help mark the spaces, although it was unclear to which space or spaces the arrows pointed. This is the sign the city had used this past week to reserve the lifeguard parking for the space to the left and right of the sign. At the request of the beach patrol, Rehoboth Beach police had Coastal Towing remove the gray Toyota mini-van on Thursday. It was towed from the Stockley Street space around 1:15 p.m.
Around 1:30 p.m. on Friday, police once again were asked to remove another unauthorized vehicle parked in the same lifeguard parking space. 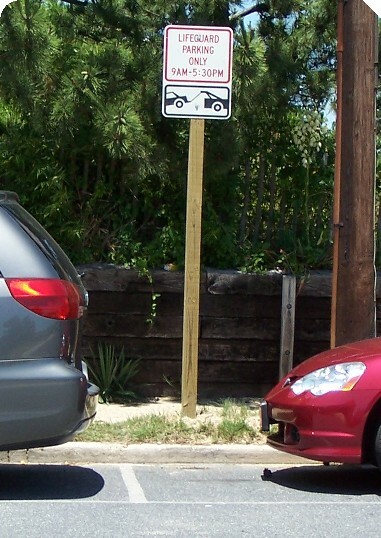 One of the three officers handling the complaint radioed her supervisor, stated that the location of the sign suggests it may only apply to the single eastern-most space. She also added that this may be an issue for the city maintenance. She said the white SUV displayed a valid Rehoboth Beach parking permit. But police issued a municipal parking summons and had it towed. 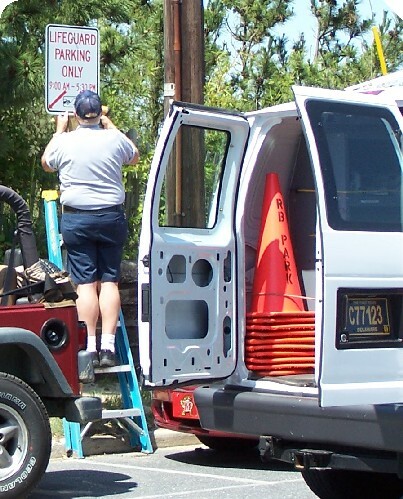 Minutes after the SUV was towed, a tech from the Parking Meter Department arrived and replaced the sign for a sign with arrows. 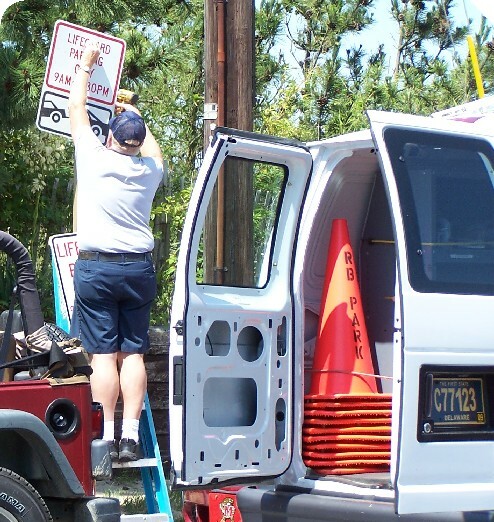 Although it may not be common knowledge to visitors, Rehoboth Beach lifeguard parking spaces are reserved in pairs at the foot of several streets in town. Signage for lifeguard parking was promised to be a discussion item for a couple Street and Light committee meetings. Commissioner Paul Kuhns said he mentioned it again over the winter and will ask that it again be included on the committee's agenda. 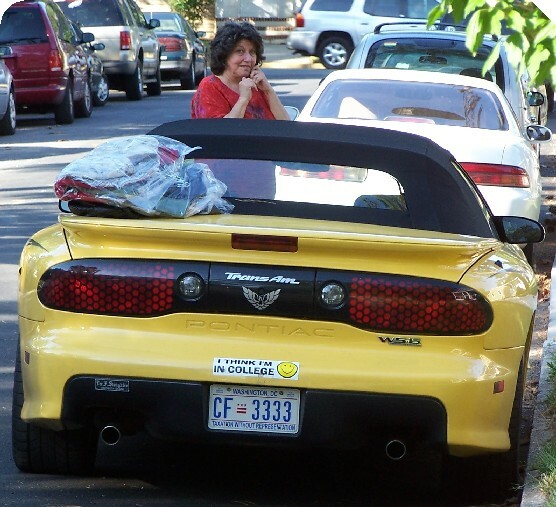 In an e-mail, Commissioner Kathy McGuiness writes "I find this upsetting and the first I have heard of the poorly marked spots, which is odd since we do have our streets dept constantly updating our lines and spots annually." Rehoboth Beach police spent the early morning hours on Friday processing the arrests of 33 underage drinkers -- all of whom come from the Washington, D.C. area. 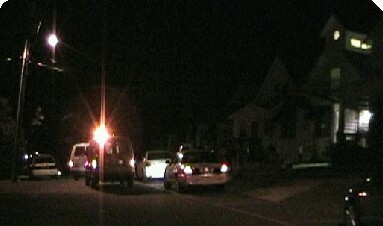 Police received a loud party complaint around 11:45 p.m. Thursday at 106 Philadelphia Street. When police arrived, they kept the estimated 30 teens inside the house until a couple paddy wagons could arrive, including one from Dewey Beach police. Eight of those arrested are juveniles and 25 were 18 to 19 year olds. WUSA-TV's Cindy Pena reported Friday that the headmaster at Sidwell Friends said he recognized the names of some of the students who graduated from the school this month. Rehoboth Beach police sought assistance from Coldwell Banker, the real-estate company which appeared to rent the historic house. But the police dispatcher said all three after-hour contacts she had listed for the real-estate agency were no longer affiliated with the company or did not answer. Those arrested come from Washington, D.C., Chevy Chase, Bethesda, Silver Spring, Takoma Park, Rockville and Potomac and were described mostly as 2007 grads of Sidwell Friends. They graduated last Friday. An 11-year-old boy tumbled in the surf Friday at Rehoboth Avenue in front of Dolle's and was flown by helicopter from the Rehoboth Elementary School to Christiana Hospital. When it happened around 1:40 p.m., lifeguards and EMS personnel reported that the boy experienced numbness and tingling in his arms and leg, right side paralysis, then a slight facial droop on his left side and slurred speech. In a radio report between the ambulance and the awaiting helicopter medic, he said he was unsure if the boy suffered a spinal cord injury or a stroke. Stephanie Callaway, Sussex County EMS spokeswoman, said on Saturday that the boy suffered a subarachnoid hemorrhage, which is bleeding of the lining between the brain and outer membrane. He remains in critical condition and underwent brain surgery on Friday. Ms. Callaway said it was unclear if the boy had a pre-existing medical condition which caused the hemorrhage, or if it were caused by a traumatic injury caused by the surf. Some customers turned around and drove away when they spotted state troopers parked in front of the Ocean Wine & Spirits. The liquor store, which is north of Rehoboth on Route 1 near the Salvation Army, was robbed around 11:10 p.m. Friday. Police broadcast a lookout for a masked man about 6-foot tall approximately 225 pounds wearing a black long-sleeve shirt and dark-colored jeans. He was armed with a shotgun and was last seen south on Route 1 from Old Landing Road. State troopers used the helicopter and a canine to search for the suspect. The robbery was captured by the store's surveillance camera. CAROL SCHWARTZ IS BACK IN TOWN! Even D.C. councilmembers take a break at the shore. Councilwoman Carol Schwartz visited her beach cottage this weekend in the Rehoboth Pines... but never too far away from her cell phone. 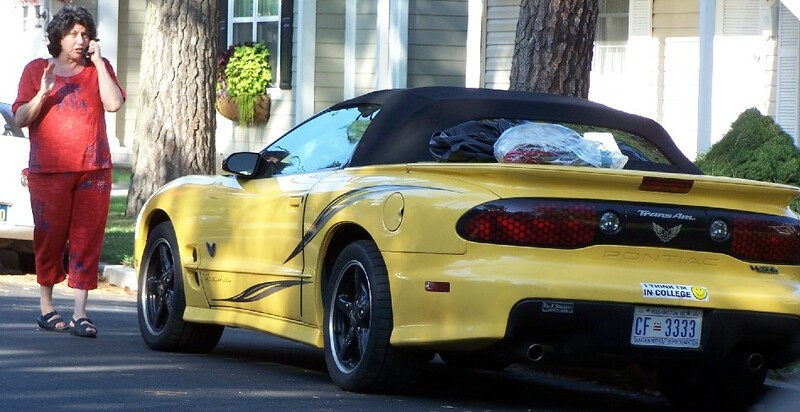 She was driving that cool yellow Pontiac Trans Am convertible. She is a Republican in the overwhelmingly Democratic city, and a popular celebrity (and good neighbor) in Washington and Rehoboth. Read her impressive biography. 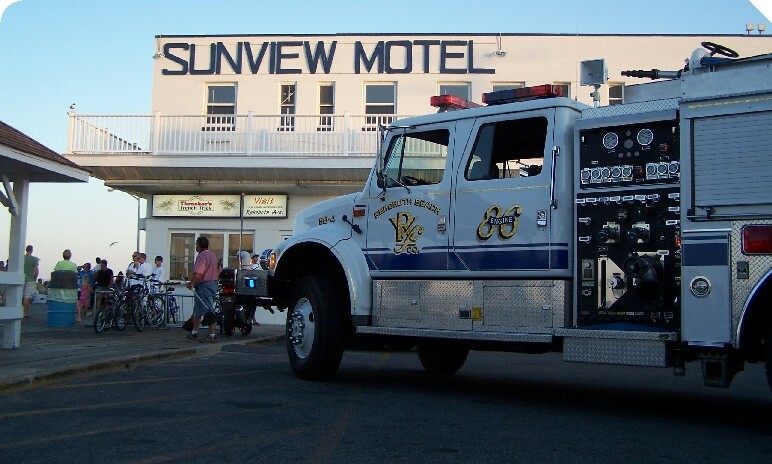 Rehoboth Beach firefighters responded to the Sunview Motel on Wilmington Avenue around 7:50 p.m. Friday after an odor of propane was reported. The motel was briefly evacuated while firefighters investigated. Suburban Propane was requested and the incident was placed "under control" by 8:10 p.m.
COULD THAT SOUND REALLY COME FROM AQUA? Rehoboth Beach police were called to the same address on Oak Avenue three times on Saturday for a noise complaint. Police noted that the distant sound appeared to originate from the other side of Lake Gerar, but could not immediately locate the source. After a second and third noise complaint at 5:25 and 6 p.m., police identified Aqua Grill as the likely source and asked them to keep it down. The popular nightspot was packed Saturday night. EVER HAVE TROUBLE MAKING DECISIONS? 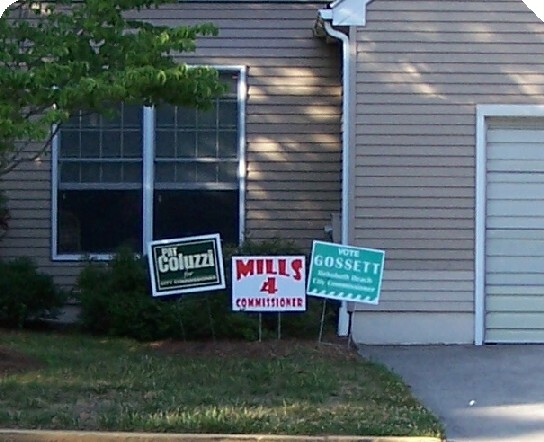 Former commissioner and election judge Richard Darley has two sets of campaign signs for all three candidates running for Rehoboth's two commissioner seats. A Rehoboth Beach ticket writer asked his supervisor Saturday afternoon if he should issue a sixth ticket to this Honda Accord DX parked at an expired parking meter in the first block of Wilmington Avenue. The answer was "yes" and that sixth ticket was issued at 2:38 p.m.
Delaware Governor Ruth Ann Minner attended "Field Day" activities at the Sussex County Airport on Saturday. 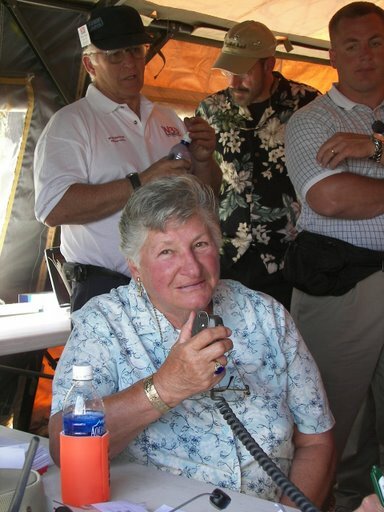 To mark the 75th anniversary of Amateur Radio Field Day, she proclaimed June as Amateur Radio Awareness Month. Field Day, sponsored by the American Radio Relay League, is an annual exercise focused at communicating during times of emergency with the assistance of amateur radio operators. It's called "Field Day" because they set-up under field conditions using equipment they would during a disaster.